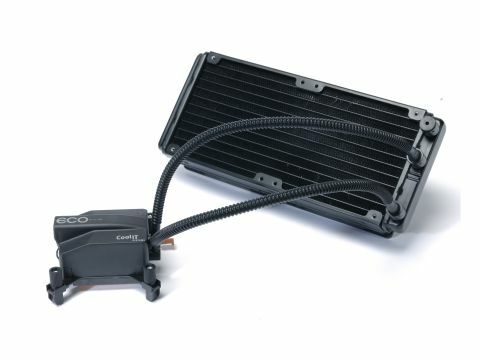 You sure you need that much cooling? CoolIT's original Eco A.L.C. has long been a favourite of ours, and now we have the new Eco C240 A.L.C, essentially the same design, but with a bigger radiator with twin fans. It doesn't matter how tall your stack of fins is, if you want heavyweight cooling for your processor then liquid-cooling it where it's at. The C240 looks automotive, as well it should as it works the same way. Liquid is circulated around, but not touching, the hot bits, and is pumped away and cooled in a radiator. The head unit carries the commendably quiet pump and is nicely compact, leaving plenty of room for air to move about over the motherboard. The universal fitting can cope with all comers: Intel's LGA 775, 1156, 1366 and AMD's AM2, AM2+ and AM3. The four point fixing uses captive bolts to screw through to the backplate, it's about as easy to fit as coolers get.